Welcome to my Jackpocket Mobile Lottery App Review! If you are looking for more information on the jackpot lottery app that was just launched in New York City, and want to know If you can get a few dollars off it, then you are just in the right place to get that. After hearing that it lets you save the time and cost to commute to buy a lottery ticket in the streets, and is doing all this for you without charging you a cent, I really didn't believe it was that honest. I thought there had to be some catch in it, so I went looking for it. So I would ask you to please pay close attention to this jack pocket review to know exactly how it operates and where the real catch is. I have also left you my final thoughts on the program to help you see if this is something you want to work with or not. Before going in detail, i must say that if you want to make a real business from home that will replace your 9 to 5 job, please see my #1 recommendation. Lottos are not something that will give you a stable income month after month. Summary: This is an app that lets you buy lottery tickets at the comfort of your home and you can play the normal lottery from your phone, and for free. 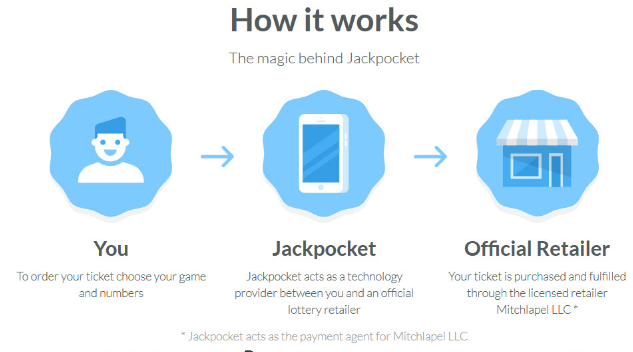 What is Jackpocket Mobile Lottery App? This is an app that lets you play the normal lottery you get in the streets from your phone, and for free. It saves you the time and effort to join the long queue waiting for your chance to buy a lottery ticket. This app can be downloaded in the IOS store if you have an Apple device but if you are on Android phones or tablets, you cannot have the app from the Google play store as it does not allow gambling apps in the system. But the good news is, you can have the app creator send you a link that will let you have the app on your Android smart device. One thing you need to note, though, this app is only for the people residing in the United States, and specifically in New York City. And you have to be physically there to register with the app. So if you are probably thinking you can cheat your way in, or trick them into thinking you are there, you are going to have an extremely hard time doing that. As you register, they will check with your GPS to confirm your current location and other secure procedures. The working brains behind the program are those of Pete Sullivan. This is not a really influential person in the industry, but he sure has created something great. He claims that he got the light bulb moment after having to put up with his father’s delays when he was a young kid for years. They would go to practice every day with this father as he was his coach. And since his father was a lottery enthusiast, and was playing them in New Jersey, he would get the numbers in before they went for practice. That means they would always be late. And this made Pete hate the lottery while growing up. As he thought about it, one day he questioned himself why his dad didn’t get the lottery from his phone so that they would save time for the games. And there came his “aha” moment. From there, he got deep into it and laid a strategy of how he would make this lottery get accessed from phones, bringing forth this program. This system took him 2 whole years to finally have it going. Firstly, you have to have a smartphone to get the app. And once you download it on the Apple store or using the link I mentioned earlier, you are going to have to register to get straight to the games. But, if you are out in New York, you won’t get any access. What happens is that they will activate the GPS on your phone to see where you are at, at the moment, and then as you fill in your registration, you will get to the part where you will have to give your phone number, and the details box for that starts with “+1” so you can’t change, which typically means no access for you. You should note that the company gets the lottery tickets from vendors in streets like Mitchapel LLC and scan the info into their system. So you get to choose the tickets online, just like you do it offline and then go ahead to play. What the company simply does is to make the access to the lottery tickets a whole lot easier than it is to get them on the streets. If you get in there, you will find six lottery games available for you to take advantage of. You will get some ads on New York State Lotto, US Powerball, and Mega Millions. But after taking the investigation further down to the app’s Facebook page, there were also signs of Pick 5 and Cash for Life, which I’m guessing is part of the six games. You also get to play in a syndicate where you need to have a Facebook account, and the same goes for your friends. Also, one of them has to be in a pool. Something that makes the syndicate fun is that the one who sets it up there has the freedom and authority to choose the lottery to be played as well as the time. This got me thinking, could they be affiliated with Facebook? Since they don’t give the same feature to other social platforms? I am pushed to agree with the claim. Wondering how the payments work? I know this is what interest you the most, and what made me too. Well, once you have credits worth $600 or below, the company will send the money directly to your account. Anything more than that, you will have to get the prize yourself, and this may incur a few charges. If you want to deposit your money in your account, a 5% withdrawal fee will be charged to your account. Also, as you claim your prize, you will have to carry your winning lottery ticket physically with you to the New York Lottery offices to get your prize. This is basically what happens in the offline world. For the record, since the app was launched on IOS, there has been 10,000 users who have registered and have won well over $40,000. This program is great for everyone who has always believed they could make money with the lottery, as long as they are in New York. If you have always believed that you have luck on your side in almost everything, and you are sure that you can pull off some great rewards from just about any lottery you come across, you need to try this one out. You don’t pay anything to play; you just need to register an account and you are done. I think this is a good way to confirm that she is still with you. If you have been winning lotteries anywhere you go, and people have gotten you to think that you have that inborn ability to get a win all the time, you sure need to put a stamp of approval on that using this app. But as you go about doing that, the are some people in and out of New York that won’t get any luck with this program going by their idea of a lottery and the effort they are willing to put into it. Who think they can hack theirs into the program? This system is highly secured and has been tested and tried several times, and all the loopholes you may be thinking of taking advantage of are probably known to them and have been well secured. If you still think that you can go past that, be my guest, and be sure to tell me what follows, as I’m positive there is going to be quite a drama after you are caught pants down! Who want to wake up to prizes effortlessly? If you are among the people who don’t want to take time to participate in the program but want to be counted among the ones who are receiving the rewards, then it is going to be very hard for you to get any substantial amount of wins out of this program. You will want to spend a few minutes to take part in them and try your luck just as others are doing it. You will want to be dedicated to playing as many games as possible to increase your chances of winning. So be prepared to get out of your comfort zone and earn your way into a reward. There is a feature I found interesting regarding the use of the program. You are going to get a feature that lets you make an automatic subscription once you have gotten the first payments made. And I think that is why as a player you have to go for the minimum amount of the subscription you have settled for, which you know is worth it. On the same page, you also get the promo codes, nonwithdrawal fees and the referral program that lets you earn more credits for each activity. And you get to use the credits either to play more games or buy tickets. You will see the credits used instead of the cash you have there, once you go to buy a ticket. The customer service of the app is just amazing. You get emails notifying you that they have received your support ticket seconds after you have submitted a message. You will then have a support specialist contact you minutes after that addressing every issue you have in the best way possible. There are no delays or confusing responses that keep you sending messages for further clarification. They are so accurate with their replies that you won’t need more explanation. And you get help 24 hours a day. This simply means, if you get issues with your account in the middle of the night, you only need to shoot a question and see a solution hit back your email address a few minutes later. You may also want to know that the app is planning to extend its reach by making it accessible to California a few months to come, and the same rules and regulations still apply. There was also time the app held its demo were in Texas and gave out free tickets, but nothing else happened like letting hem in. You may also find the program not running currently as there is a fight going on between the app owners and the NYS Gaming Commission. You are not paying a dime for using the app; you do it totally for free. The app has shifted the costs of using it to the owners of the tickets so that you have utmost convenience as you use it. The support there is great, your receive a reply in just minutes after you have sent your query. You don’t have to get stuck for days waiting for someone to come to the rescue. The app does pay. Quite some people have reported winning and getting the money. So you need not worry about spending your free time to do something that doesn’t appreciate your effort. The method of operation is quite a reasonable one. You don’t get strategies that will get you thrilled to make millions overnight and then, instead of paying you the huge amounts you have won, the end up ripping you off the little you have. You get safe and secure payment methods. You won’t be asked to submit sensitive information you know is highly confidential and may get your account hacked. A short while after releasing the program for the first time, there were 10,000 users registered and a little over $45,000 paid out, so this means that it is something that pays well and is effective. It is amazing to have control when you participate in the app’s Facebook syndicate that gives you the power to determine the date and the lottery. You get a variety of ways to earn credits that give you more chances to play the games or cash out the money. Leave all those lottos and start your journey with my #1 recommendation. The app is only limited to United States citizens who live in New York City. No matter how much you fall in love with the app, you can’t get to have the full ability to work with it, if you don’t reside there. The company seems to be affiliated with Facebook as it only allows you to get into the syndicate through Facebook alone, you don’t get this feature on other networks like Instagram or Twitter. You just cannot sit and wait for the lottery. If you are totally relying on this, its ridicolous. How many people you have seen have won a lottery. Those are very rare. So, instead of relying only on your fortune i recommend you to do it for yourself. The program is generally good; you are getting an app that is volunteering to help you get you buy lottery tickets in the comfort of your home without paying extra. And this is going to save the daily walk to the streets to buy them as well as the costs that come with that. You also get a variety of ways to help you earn credits. This means that you are not stuck with one strategy that may get you bored very easily due to the monotony of it. And to sweeten the pot, you have the option of either reinvesting the credits for more games or just cashing the money out, which is great. Most online programs I know don’t give you this. As I see it, this is a huge effort for an app that just launched, to be giving such great features and helping people make money in an easy and fun way. This app is, by all means, legit and safe! Have you been using this app? How does it feel? Are you actually making money with your account? How much have you made so far (if you are kind enough to share that)? Have you been on any other online lottery programs? According to you, can they measure up to this one? Please leave your feedback below. Want a program that will help you create a long-term income stream? Want a system that will help you create an online business you will have entire freedom and authority over? Want a program that is 100 times better than the Jackpocket system? Then check out my #1 recommendation. I hope you will like my Jackpocket Mobile Lottery App Review and if there is any question in your mind, please ask me in the comment section.